With very little practice you can do scale drawings like this one of an old fashioned pitcher pump. 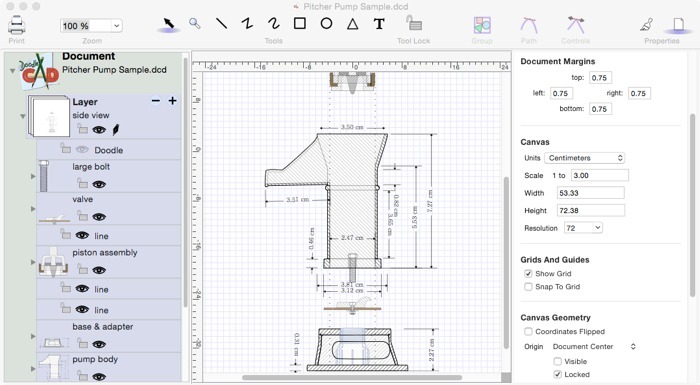 With DoodleCAD, each individual part of this drawing such as the lower valve and piston assemblies were done in separate documents at different scales and then assembled into the finished document later. Note that all the parts fit together without any adjustments. You don't have to be an artist to do art. This tree frog was done in just a few hours of work. 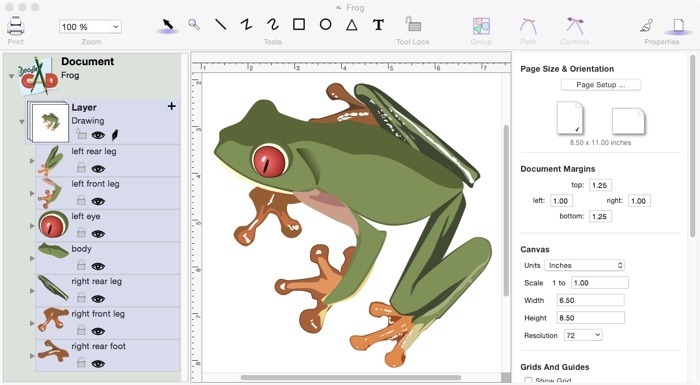 Just drop an interesting image from any source such as your digital camera onto the canvas; create a layer over the image and start tracing. Do you have a picture of a favorite pet that you always thought would make a great sketch? Were you afraid to try because it seemed too hard. This drawing was done based on a photo of my pet ferret Alvin. My wife added the santa hat and Christmas present for a Christmas card. Fun and easy to do. Copyright © 2005-2019 DoodleBytes, LLC. All Rights Reserved. DoodleBytes, DoodleCAD and BoogerFlick are trademarks of DoodleBytes, LLC. Mac, the Mac logo, Mac OS X, iWork, Pages, and Macintosh are trademarks of Apple Computer, Inc.. All other trademarks, registered trademarks, product and/or brand names are the sole property of their respective owners.